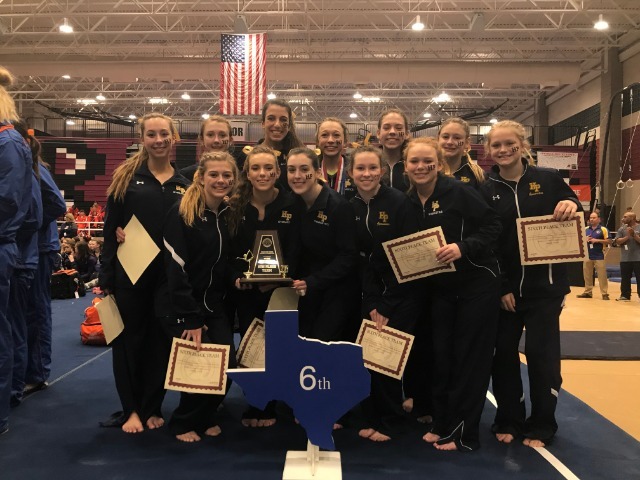 The Lady Scots Gymnastics Team had a successful State Championships placing 6th in the State among an extremely strongly field of competitors. Junior Tatum Meeks led the team with 8 strong routines over two days of competition. Tatum placed 2nd on Bars, 4th on Beam, 6th on Vault and 4th All-Around. She scored season high scores on Compulsory Bars, Optional Floor, and Optional All-Around. Her highest score of the meet was 9.85 on Compulsory Vault and Bars. Tatum was also recognized with All-State honors. Junior Lily Overton was the second highest All-Around placement for Highland Park. She finished out of the medals but had 8 hit routines over the two days of competition. Lily scored season highs on Compulsory Bars and Optional Floor. Her highest score of the meet was 9.675 on Compulsory Bars. Senior Allison Walters finished out her career as a Lady Scot with 8 hit routines at State. Allison scored season highs on Compulsory Bars, Optional Vault, Optional Floor, and Optional All-Around. Her highest score of the meet was 9.725 on Compulsory Vault. Junior Captain Katherine Downing competed in the all-around at the State meet. She scored a season high on Optional Bars. Her highest score of the meet was 9.5 on Compulsory Floor. Freshman Carly Hart competed on 7 out of 8 events at the meet. Carly scored season highs on Optional Vault, Optional Bars, and Optional Floor. Her highest score of the meet was 8.8 on Optional Floor. Senior Grayson Gale competed on Bars, Beam, and Floor at her final State Championships. Grayson scored season highs on Compulsory and Optional Bars. Her highest score of the meet was Compulsory Bars. Senior Lexi Epstein, a 4-year competitor, competed on Vault in her final meet as a Lady Scot. Freshman Lauren Cimorelli competed on Optional Floor and scored a season high. Freshman Marisa Albarran competed on Compulsory Beam, and Freshman Emily Conaty competed on Optional Beam. Congratulations to the Lady Scots for a fantastic season! We are so proud of you.